If you are looking for a replacement cartridge or roll for your Xyron laminator, you have come to the right place. We carry the complete line of laminating cartridges and roll films for all of the Xyron laminators including the 510, 850, 900, 1200, 1250, 1255, 2500 Pro, and the Xyron 4400. We even offer cartridges for the complete line of Create-A-Sticker machines. Whether you are looking for a two-sided lamination cartridge, a permanent adhesive cartridge, a repositionable adhesive cartridge, or a combination that includes both laminate and adhesive, we carry them all. Check out the huge selection below! This is MyBinding video. If you’ve fallen in love with your Xyron product and you need more laminating cartridges, we’ve got them all. We carry the complete line of laminating cartridges and Xyron roll films for all of Xyron’s laminators, including the Xyron 510, 850, 900, 1200, 1250, 1255, 2500 Pro and the Xyron 4400. That may be a mouthful but our warehouse is even more full. 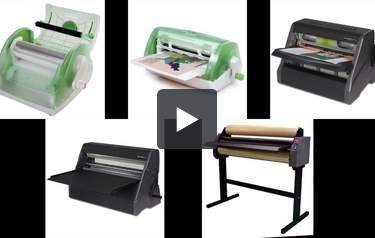 We also carry the complete line of Create-a-Sticker machines and their supplies. So whether you need double- or single-sided lamination or permanent or repositional adhesives, we have what you need and we want to be your source. We believe in customer service and we want to be here for you so give us a call. When image matters, MyBinding.